I wrote a previous post on “7 tips for recruiting references for internships, jobs and graduate school.” So I’d encourage you to read that post, too. #1 – Request the letter of recommendation well in advance of the deadline. Remember that faculty members have lots going on, just like you do. Try to make your request at least two weeks prior to the deadline. You may run across an internship deadline only a few days prior to the deadline. You will have to decide if that’s adequate time for the faculty member to write the recommendation for you — and then be prepared if you haven’t provided adequate notification. #2 – Provide the information that will make it easier for the faculty member to write the recommendation. When you are communicating with the faculty member about the letter of recommendation, provide your update résumé and the link to the internship/job information. I appreciate it when the student has the contact person’s or committee’s name and address typed in an email to me so I can copy/paste that info into the letter I’m writing. Remember that the faculty member probably won’t know all the factors that you are including in your own letter of application. Some of that information could help us in writing our letters of recommendation. Why are you interested in this particular internship? What do you consider your strengths as a potential employee? So include that info or include the letter of application or a paragraph or two of explanation. Be sure to clarify how the letter is to be submitted. As part of the packet that you are submitted. In that case, typically the faculty member gives you the recommendation in a sealed envelope. Emailed to a contact person or organizational email address. Be sure to provide the email address. Snail mailed separately from your application package. Offer to provide a stamped and addressed envelope. Uploaded to an organization’s job processing website. The faculty member needs to be alert to the email that will include the URL for submitting the recommendation. #3 – Consider how many letters of recommendation you are asking the faculty member to write for you. Computers can help us in writing letters. We can write the first letter of recommendation for the person and then modify it for the next recommendation for that individual. But even modifying a letter takes time. I talked with a doctoral student who has 100 jobs in his current search. He wasn’t planning to apply to all of those, but I did get the sense that he would be applying for several dozen. I was thinking of his doctoral advisor and how many letters the student eventually would need. Thankfully, many positions don’t require letters of recommendation until you are a finalist for the job. But consider how many letters you are asking someone to write on your behalf. #4 – Be sure that you have carefully edited your own materials. You don’t want to ask a faculty member to give you a strong recommendation if your own materials don’t reflect well on you. Editing your materials also means be mindful of how you label your files. If your file is called resume.pdf, so could lots of other resume.pdf files. A better naming approach = last_name_resume.pdf. No spaces and all lower case. #5 – Be alert to cues if the faculty member doesn’t immediately agree to write the recommendation. Sometimes faculty members are hesitant to say “yes” to writing a recommendation for you because they are busy. But sometimes they are hesitant to say “yes” because they won’t be able to write a strong recommendation for you. They are thinking about the late work your turned in for class. They are thinking that you haven’t contacted them in the two years since you took a class with them but are now because you need a letter of recommendation. Don’t try to make the faculty member guilty: “I won’t get this internship unless you write a letter for me.” If they say “no,” don’t be mad. #6 – Send polite email reminders of the upcoming application deadline. #7 – Send a thank-you email. 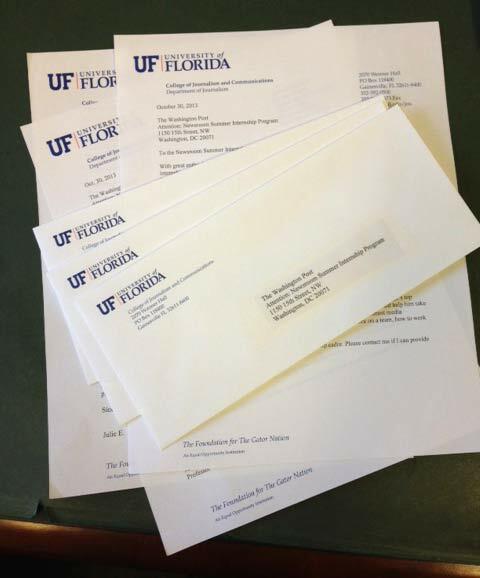 Be sure to thank the faculty members who have written letters for you — and let them know what happened regarding the internship or job you were applying for. I’ve found that an email can be more helpful for me than a hand-written thank-you note. Sometimes when I’ve received a particularly good thank-you email, I include that in my annual evaluation package for my department chair to see. Best wishes with your job search. Now, back to writing letters of recommendation. Calvin – Let me know if you or your students have any tips to share or questions regarding letters of recommendation.